We have walked many a trail on Exmoor around Brendon Common and Doone Valley but a couple of times a year we step over the border to visit one of Somerset’s most popular attractions, the Tarr Steps. 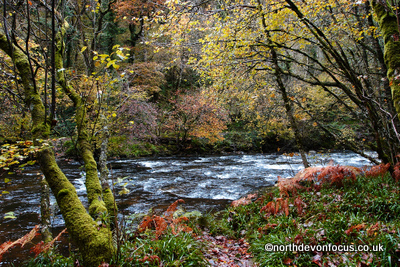 Located in Exmoor National Park between Withypool and Dulverton, there is a car park and toilets close by. (see map). The Exmoor National Park Authority are in the process of revamping the information at Tarr Steps top car park to include new interpretation boards, a new leaflet and circular walk so watch this space. At this time of year you can hear regular Kok-Kok followed by a clapping sound, this is pheasants from a local Shoot, watch out for them flying, flapping, feeding or roosting in the trees. It’s a gentle stroll down beside a lush meadow with views over to the wooded valley. You will eventually pass by Tarr Farm Inn and Restaurant before reaching the main point of interest, the ancient clapper bridge which spans the fast-running River Barle. The lower car park is for disabled visitors only, there is an ice cream kiosk here in the Spring and Summer. The Tarr Steps, like Clovelly is probably one of the most photographed tourist attractions and is popular with amateur and professional photographers as well as happy family snappers. Beside the huge stone slabs is a busy ford, 4x4’s, horse and riders make it look easy but mountain bike enthusiasts normally have a bumpy crossing and receive applause from onlookers if they succeed without falling into the brink. Canoeing is only allowed (by arrangement) downstream of Tarr Steps in order to reduce any potential impact on breeding birds and mammals. Nature lovers please note that the woodland around here is internationally significant for the mosses, liverworts and lichens. It was made a National Reserve in 2004. Local residents include dormice, which make their home in hazel, blackberry or honeysuckle. If you’re lucky you might just spot an otter or an eel. The Jubilee Trail, part of the Golden Walk series, is a short circular walk, signposted with orange waymarks from the bridge. Please scroll down for information on the longer route from Dulverton. The area is particularly colourful towards the end of October when these photographs were taken. The green spikes amongst the rusty leaves and bracken are an indication that come Spring the woods will be filled with bluebells. Please enjoy the slide-show. Tarr Steps is a 17 span clapper bridge (a bridge made of unmortared stone slabs), the longest of its kind in Britain. It was first mentioned in Tudor times but may be much older. The river has silted up over the last century and often now comes over the stones in times of flood. The bridge has had to be repaired several times as stones of up to two tonnes have been washed up to 50 metres downstream. Ordnance Survey Explorer Map OL9. Ordnance Survey Landranger Map 181. THE BIG SHEEP HALLOWEEN FESTIVAL STARTS SATURDAY! AUTUMN EXPOSURE. COASTAL EROSION WESTWARD HO! North Devon Focus . Simple theme. Powered by Blogger.